As Valentine’s day approaches, more and more designers are searching for quality brushes to aid them in creating their Valentine designs. We put together 30 Free Adobe Photoshop Valentine Brush Sets to make sure our fellow designers have high quality brushes in time for Valentine’s Day…. This collection of brushes will help you create astounding designs for your loved ones to help celebrate a day of love. Check out this awesome heart brush collection and download the brushes you like best. Each set of photoshop heart brushes is unique, so make sure you don’t miss any of them. Browse through our collection and use the brushes wisely… Have fun!!! A set of 24 vintage style brushes for every occasion of love. The brushes within this set are large sized and a full sized preview is available if you click the picture above. A series of hearts are included in this cute little brush set. 22 Floral style brushes for Valentine’s Day. These Valentine’s Day brushes are high resolution! A set of 20 high resolution floral brushes perfect for Valentine’s Day. 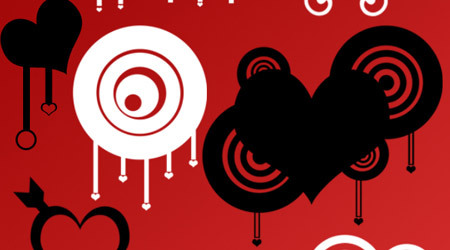 A series of vector scanned brushes shaped like hearts for Valentine’s Day. Twenty-five brushes for Valentine’s Day ranging from red rose brushes to heart brushes. Perfect brushes for invitations and love notes. A set of 20 vector hearts for Valentine’s Day. All vector heart brushes come with unique designs and are sized differently. Several kinds of hearts in both brush and PSD form. Make sure you check the link for information on how to open these vector heart brushes in time for Valentine’s Day. A beautiful set of Valentine’s Day stamps and brushes useful for developing templates, designing Valentine’s cards, and creating elegant Valentine’s Day designs. Make your backgrounds stand out with 21 unique Valentine’s Day brushes. Inside, you’ll find hearts and floral accents to make your backgrounds stand out and your Valentine’s themed cards and notes appear unique. 12 high resolution grunge style brushes just in time for Valentine’s Day. 24 Heart shaped brushes for Valentine’s Day. This Valentine’s heart brush set is more of a grunge design, perfect as a background or part of a theme. These 18 brushes are inspired by love and perfect for any Valentine’s Day themed design. 50 hearts are included in this Valentine’s heart brush pack. The designs range from grungy to hand drawn, these shapes will be the perfect accents to any Valentine’s Day card design. These 11 heart fractal Photoshop Brushes were made with Apophysis and add a cool flair to any design made with love. These hand drawn heart brushes will look wonderful on any card or love note. These 18 grungy floral brushes will definitely make your Valentine’s Day design stand out with cool heart brush effects. The Hearts in Motion Brush set will give you some great Valentine’s Day design ideas for any card or theme. These hand drawn heart brushes will add a touch of personality to your Valentine’s Day designs. These romantic envelope designs will give you ideas of how to personalize your Valentine’s Day Stationary. The 20 heart brushes in this Valentine’s Day brush set will add attitude and style to your Valentine’s Day designs. Show your love with these elegant and simple Valentine’s Day designs. These heart stamps will give your Valentine’s Day stationary that hand made touch to let people know you put love into it. This set contains 14 heart shaped brushes that would be perfect as accents to a Valentine’s Day card or background. These heart brushes look and feel hand drawn. Make your Valentine’s Day cards look beautiful with these chic hearts. These 8 heart shaped brushes give that grungy feel to any Valentine’s Day card. Use these in the corners of your stationary or as accents to your designs. The 6 brushes included in this set cap off our series. The vector brushes pictured here have paint spatters and stylized circles to add to the heart shaped Valentine’s brush design.